Gold's great virtues of malleability, ductility, reflectivity, resistance to corrosion and unparalleled ability as a thermal and electrical conductor mean it is used in a wide variety of industrial applications consuming close to 300 tonnes annually. The prime use is in electronics. Our age of high technology finds it indispensable in everything from pocket calculators to computers, washing machines to television and missiles to spacecraft. The rocket engines of American space shuttles are lined with gold-brazing alloys to reflect heat, and the lunar modules of the Apollo programme that put men on the moon were shrouded with gold foil acting as a radiation shield. More commonly, the humble touch telephone in your home typically contains 33 gold-plated contacts. The plating of such contacts in switches, relays and connectors is the major application of gold in electronics. Contacts are electroplated with a very thin film of gold using gold potassium cyanide (GPC), often called plating salts. This touch of gold on a contact ensures rapid dissipation of heat and guarantees freedom from oxidation or tarnishing at extreme low or high temperature, thus providing an atomically clean metal surface with an electrical contact resistance close to zero. Not surprisingly "nothing is as good as gold" to provide total reliability, whether out in space or in the home. The production of plating salts accounts for 70% of the more than 150 tonnes of gold used annually in electronics. Althoughnew technology has enabled plating thickness to be pared down to less than one thousandth of a millimetre of gold. Gold consumption has been maintained because of the myriad new electronic applications. Gold's other main role in electronics is in semiconductor devices, where fine gold wire or strip is used to connect parts such as transistors and integrated circuits, and in printed circuit boards to link components. Again, the need for reliable connections makes gold indispensable. This bonding wire is one of the most specialised uses of gold; it is highly refined to 999.99 purity and the wire has a typical diameter of one hundredth of a millimetre. Japan is the major fabricator of electronics products in the western world, accounting for over 45% of gold consumption, followed by the United States with nearly 30%. The United Kingdom and Germany are the only other significant contributors at about 6 and 7% respectively although South Korea is growing. Dental gold is the second important sector. Gold has been used in dentistry for almost 3000 years. The Etruscans in the 7th century BC used gold wire to fix substitute teeth when their own were lost. In the 16th century an early dental textbook recommended gold leaf for filling cavities. Gold's malleability and resistance to corrosion render it eminently suitable for dental use, although its softness means that it must be alloyed to retard wear. The most common companion metals are platinum, silver and copper. A typical alloy may contain anywhere from 620-900 fine gold depending on the precise end-use. In recent years the price of gold has resulted in a trend towards cheaper alloys with as little as 30% gold and towards palladium-based alloys which contain scarcely 2% gold. Gold alloys have also suffered competition from new techniques such as ceramic dental crowns. In addition, social security payments for gold dental work have come under tighter scrutiny; reductions in such insurance payments make gold use more price sensitive. These factors initially contributed to a sharp fall in gold use by the dental sector, from 64 tonnes in 1980 to 48 tonnes by 1987. However, there has since been a recovery because of its non-allergic properties; demand has revived to 60 tonnes annually. Japan is the leading dental gold fabricator, accounting for roughly 28% of the market, followed by Germany and the United States. There is significant unrecorded use, however, in Asia and Latin America where it is not unknown for dentists to melt down gold coin to make their own alloy. Other applications for gold include decorative plating of costume jewellery, watchcases, pens and pencils, spectacle frames and bathroom fittings. Gold-based points are used for decoration of china and glass. Demand for gold from this sector is around 90 tonnes per year. The gold is used in various forms, such as rolled gold and gold fill, although both of these are under competition from new techniques. On the other hand, the use of gold electroplating in watchcases and similar products is increasing. Visually, the most spectacular use of decorative gold is gold leaf which has been used for centuries to adorn the domes or ceilings of public buildings, because its resistance to corrosion means it will outlast paint by many years. Gold's ability to reflect heat in summer and help retain it in winter has also led to the use of glass coated with a thin film of gold in several modern buildings, especially in North America; one ounce of gold covers typically one thousand square feet of glass. This reflective glass can cut cooling and heating costs by 40%. The major consumption of decorative gold is in the United States and Japan. All told, the industrial uses of gold provide a very steady element in gold demand, requiring more than the equivalent of all Australian gold production annually. 2003 was a particularly difficult period for the South African gold mining industry as the combined effect of the stronger rand, the lower rand gold price and cost pressures eroded margins and resulted in a number of shafts and mines becoming loss making. 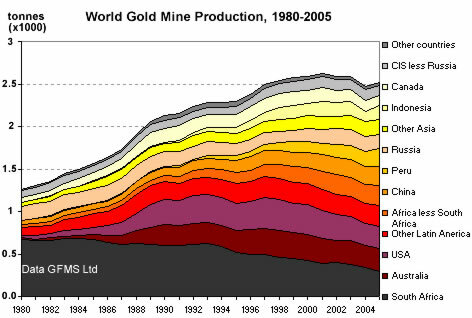 Given the financial pressures and the exhaustion of certain older shafts, South African gold production declined in 2003 by 4.7% to 375.8 tons. For Chamber member gold mines the 6.8% improvement in average grade could not offset the 16.2% decline in tons of ore milled and hence production fell by 10.4% to 311.3 tons. The gold sector remained the mining industry’s largest sector by value and South Africa’s largest export contributor. Total gold sales were R33.1 billion in 2003 – a decline of 20% on 2002. Despite the 17.3% increase in the US dollar gold price to US$364/oz in 2003, the 28.2% appreciation in the rand exchange rate resulted in the rand gold price falling 15.8% to R87 952/kg. The key reason behind the rise in the US dollar gold price in 2003 was the continued dehedging by producers and a surge in investment demand. The change in US dollar prices was partly reflective of the weaker US dollar against the Euro with the gold price in Euro relatively unchanged in 2003. Other factors providing a supportive environment for gold include the global commodity boom, producer dehedging and geopolitical issues, which assisted investment demand. According to GFMS the total supply of gold rose by 4.3% to 4142 tons in 2003 on the back of a marginal 0.1% increase in global gold production and slightly higher levels of central bank sales and old gold scrap. New mine supply accounted for 63% of total supply while scrap and central banks sales accounted for 22.7% and 14.6% respectively. The extension of the European Central Bank gold agreement from 2004 to 2009, which caps sales to 500 tons/year will continue to provide certainty to this aspect of supply. Given the consolidation of the global mining industry during the 1990s and the decline in exploration expenditures for gold in the late 1990s and early 2000s, the likelihood of increases in new mine supply in the short-term is moot. However, the pick-up in global exploration in 2004 will probably feed through into new production in the emerging producer sector in the mediumterm. A marginal increase in other fabrication demand and a surge in investment demand by 391% to 600 tons offset the third year of consecutive decline in demand for jewellery fabrication of 5.5% to 2533 tons. The increase in the number of patents registered and increased research for industrial applications for gold in areas such as nano-technology and catalytic converters bodes well for future demand. It is known that the Egyptians mined gold before 2000 BC and the first coin containing gold was struck in the eighth century BC. It is believed that the first pure gold coin was struck on the orders of King Croesus of Lydia in the sixth century BC. The best estimates available suggest that the total volume of gold mined over history is approximately 155,500 tonnes, of which around 64% has been mined since 1950. The upward trend in annual production is now levelling off, due not least to a considerable slowdown in exploration spending in the late 1990s. Independent analysts are of the belief that mine output will remain flat for the next few years and may even drop slightly. For a history of gold mining, click here. Gold is produced from mines on every continent with the exception of Antarctica (where mining is forbidden), in operations ranging from the tiny to the enormous. The dominant producing country for much of the 20th century was South Africa, which in the early 1970s was producing 1,000 tonnes per annum, or over 70% of the world total at that time. This position has been eroded in the past two decades, however, as South African production has dropped (due in part to ageing mines and reduced flexibility), while other nations have expanded their output considerably. Nonetheless, in 2005 South Africa remained the world’s largest producing nation, with just over 296 tonnes and 12% of the total, but Australia was not far behind with almost 263 tonnes (10%), closely followed by the US with 262 tonnes. The most spectacular rises in output over the past decade have come from Indonesia, which in 1992 produced just two tonnes of gold but in 2005 produced over 167 tonnes, predominantly from the Grasberg mine, which is the world’s largest gold producer, from a copper-gold deposit (Rio Tinto and Freeport Copper & Gold in a joint venture); and Peru, where production has risen from 18 tonnes in 1992 to 207 tonnes in 2005, of which almost half came from Newmont’s Yanacocha mine, the second largest in the world, which is 14,000 feet above sea level in the Andes. At the other end of the scale, there are a myriad of very small “artisanal” miners operating as one-man bands, panning for alluvial gold or working shallow outcrops in many parts of Africa, Latin America and Asia, and finding perhaps only a few ounces in any one year. Increasingly gold is mined in developing countries (other than South Africa) including some of the poorest. Many of those designated as Heavily Indebted Poor Countries by the World Bank are gold producers. For some of these countries gold comprises a significant proportion of their exports; it accounts for over a third of goods exports in the case of Ghana and around half for Mali, for example. Some mining companies refer to their output in terms of ounces, and their ore grades in terms of ounces per tonne (or in some cases in North America, per short ton). Others use the metric system. For a table of weights and conversions, click here. In the main, gold is thought of in terms of the troy ounce, which takes its name from the old French city of Troyes, where there was a regular marketplace at which gold was traded. Grades vary enormously with ore bodies. Generally, the largest South African underground operations run at between eight and ten grammes per tonne (i.e. eight to ten parts per million), with more marginal South African operations grading between four and six grammes per tonne. At a grade of 10 grammes/tonne, therefore, it takes more than three tonnes of ore to produce one ounce of gold. Many of the world’s operations are open pits, which tend (generally) to be of lower grade than the underground mines, running from as low as one gramme to three or four grammes per tonne. While this low grade is instructive in that it shows how rare gold is in the ground and gives an idea of how much rock has to be shifted to produce the metal, production costs are a more important parameter in determining the quality of an operation and these are a mix of both grade and operating costs. The world’s deepest gold mine is currently the Savuka (which means “rise up”) mine on the north-west rim of the Witwatersrand Basin in South Africa. This operation mines to a depth of 3,777m. Savuka yielded 5.68g/t in the fourth quarter of 2002. This means that, on a simplistic basis and working solely to the average numbers (and assuming a rock density of approximately 3.5kg m-3), some of Savuka’s miners are working at a depth of almost 2.4 miles, mining an ore grade which contains almost 20 cubic centimetres of gold in every cubic metre of rock. That’s just under 20 parts per million by volume and attests to the high technological achievements of the industry. Production costs vary widely, according to the nature of the mine, be it open pit or underground and at what depth, the nature and distribution of the ore-body (and by implication the metallurgy which affects processing techniques) and the grade. Average quoted cash costs for 2005 were estimated by GFMS at US$269/ounce with total cash costs (including depreciation, amortisation, reclamation and mine closure costs) at US$339/ounce. Note also that these figures do not include greenfield exploration and other ancillary costs and so most mining analysts add a further $30-40/ounce, depending on the mining company concerned, to come to an estimate of true total costs. Thin margins made by the mining companies in the second half of the 1990s meant that exploration expenditure tended to suffer. Data on the supply and demand for gold are compiled by GFMS Ltd. The company provides a number of tables exclusively for the World Gold Council. The following table shows a summary of gold demand. Links to more detailed tables, and to notes and copyright information, are given below. Please note the restrictions on disseminating these data. Notes: Source: Tonnage data are GFMS Ltd. Value data are WGC calculations based on GFMS data. 1. Identifiable end-use consumption excluding central banks. 2. Provisional. 3. "Other retail" excludes bar and primary coin offtake; it represents mainly activity in North America and Western Europe. 4. Exchange Traded Funds and similar products including LyxOR Gold Bullion Securities, Gold Bullion Securities (Australia), streetTRACKS Gold Shares, NewGold Gold Debentures, iShares Comex Gold Trust, Central Fund of Canada and Central Gold Trust. The gold price used in the charts and statistics on this site is the London PM fix. This price is quoted in US dollars. Where the gold price is presented in currencies other than the US dollar, it is converted into the local currency unit using the foreign exchange rate closing price on the same day. For example, the London PM fix on 31st October 2003 was USD 386.25 and the closing price for one USD was GBP 0.591. The gold price in pounds sterling (GBP) would therefore be calculated as GBP 228.24. Like all prices, the gold price reflects not only the inherent value of gold, but also the relative strength of the currency in which it is quoted. For example, the dollar price of gold may increase more in percentage terms than the sterling price of gold, to the extent that the change in price is a reflection of dollar weakness (in this case, against sterling) rather than an intrinsic change in gold market fundamentals. For this reason, our Investment Statistics contain charts showing an index of the gold price in US dollars and local currency units as well as the relevant US dollar / local currency unit exchange rate for countries other than the United States. In addition, our “G5” price index is an average (weighted by GDP) of the gold price in US dollars, Euros, Yen, Sterling and the Canadian dollar; this is calculated to compensate for changes in the gold price that are simply a reflection of one currency’s movement.